Your business has a competitive edge, so maybe it’s time to add a printer with that same backing to your existing office technology. The compact Xerox Phaser 4510 from Pacific Office Automation provides the robust backing your office needs to charge forward and maintain optimal productivity. Industry-leading paper input and output capacity come with the base configuration of this printer, saving you time you might otherwise have had to spend refilling your printer. This model also features a higher print resolution than its competitors; the Phaser 4510 can print at an amazing resolution of 1200 x 1200 DPI (dots per inch)—even at its top output speed of 45 pages per minute. Xerox’s advanced design is built to last, featuring a monthly duty cycle of up to 250,000 prints. Your office can trust in the fact that this machine is truly meant for the long haul. Additionally, your office will be able to experience the joys of a reliable paper pick and other feed operations that will keep your print jobs flowing smoothly—without constant paper jams. Heavy media, like cardstock, can also be printed with great reliability, allowing you to keep all projects in-house. Even if problems do arise, automated online troubleshooting with PhaserSMART technology gets your office back to work quickly and without hassle. All of these impressive elements are backed by Phaser’s 533 MHz processor and 40 GB hard drive which support quick communication between your network and your printer. 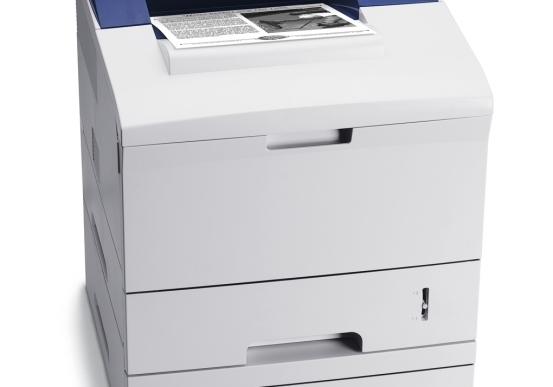 For unbeatable dependability and workflow improvement, add the Xerox Phaser 4510 to your workplace today.